Handles for wheelchair seating. Bar Ends slide over seat back tubes and work as handholds. Attaches to the seat back posts on either Large or Small Wheelchair Seat. 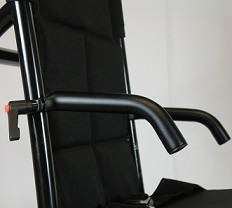 Attaches to the seat back posts on either Large or Small Wheelchair Seat.